It arrived almost one year ago – the longest any book in my collection has been before before making it onto the blog. This was listed as a Near Fine when I purchased it, but I think it’s not really up to that standard. More like a VG or VG+. Interesting if somewhat disturbing cover by my fave Ric Binkley, not one of his better efforts in my opinion though. Let’s have a look see. Very bright cover. 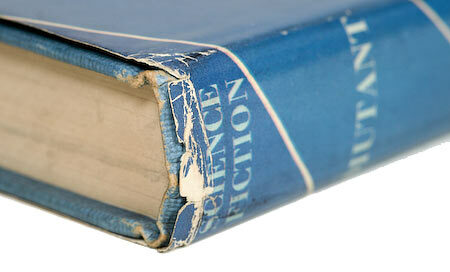 The jacket is in pretty good condition except for the spine. The boards aren’t too bad either. It’s had a bump on the top front edge at some time. You can see the corresponding knock on the jacket below. The block shows no discoloration though is perhaps a little grubby around the edges. 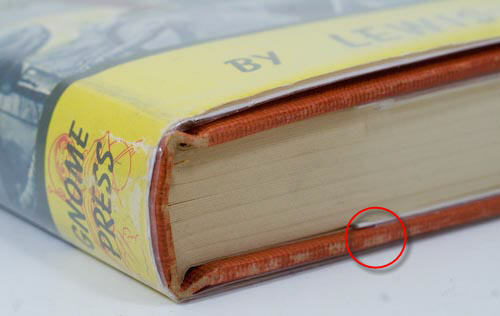 The head of the spine is the major issue with this copy, it’s been bumped and the jacket is damaged. The tails ok though, if a little soiled. The back of the jacket looks nice but also a bit soiled. Not too bad though. 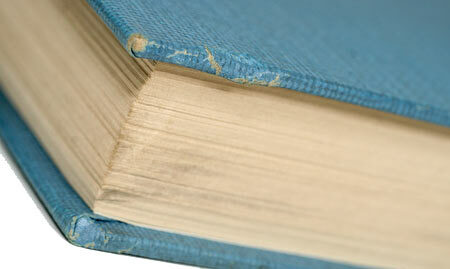 Binding: Turquoise blue boards with darker blue lettering on the spine. 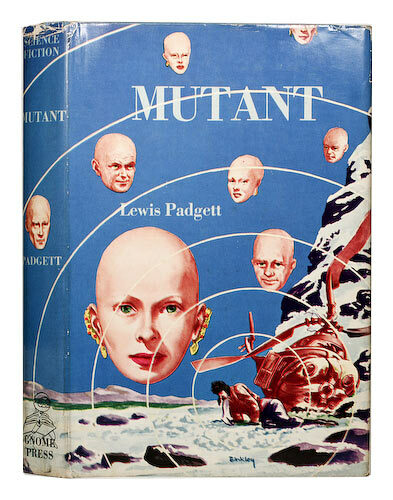 Comments: A little overpriced at $75 perhaps, but after all this is the Lewis Padgett team. 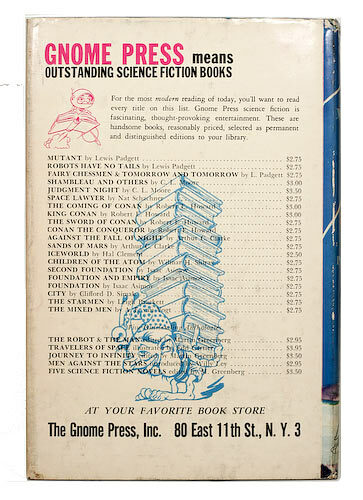 Reasonable condition all-round except for the top of the jacket on the spine. Catherine Lucille Moore is probably the better known half of the Lewis Padgett team. Her husband Henry Kuttner – the opposite half – being more prolific but writing under numerous pseudonyms. I use the phrase ‘opposite half’ here for good reason. 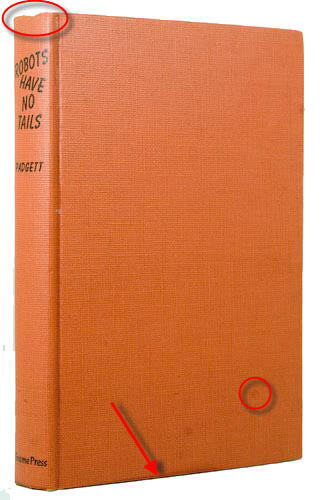 I read Padgett’s ‘Robots Have No Tails’ several months ago (see the Close Up & Review) and since discovered that it was in fact as claimed by Moore herself, penned entirely by Kuttner. These two books provide an interesting basis for comparison and I do indeed find Ms Moore’s and Mr Kuttner’s styles to be opposite. 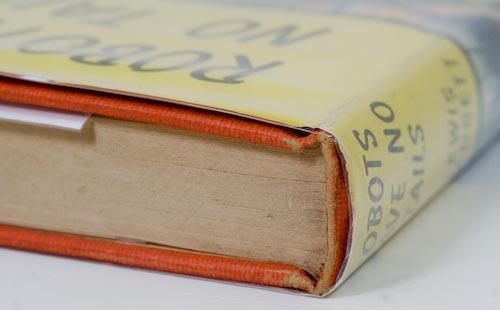 ‘Robots’ is light, whimsical, funny and is a breeze to read. 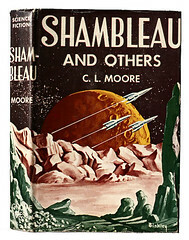 ‘Shambleau’ is very, very different. Dark, heavy and serious are words I’d use to describe Ms Moore’s work here. While we are touching on the style of prose in this book, a couple of other authors sprang to mind while I was reading. It didn’t take long for me to identify similarities with H.P. Lovecraft. Quite often a turn of phrase here, or a word there would remind me of the great man. Here is an example as Northwest Smith reflects upon “fearful symmetry” as he regards Thag – the Tree of Life – for the first time. Truly a more than human agency must have arched these subtle curves so delicately into dreadfulness, into such an awful beauty that the very sight of it made those atavistic terrors he was so sternly holding down leap in a gibbering terror. I’m sure you’ll agree, this could be lifted straight out of any Lovecraft story. I’m not suggesting C.L. Moore is an H.P.L. knock off, just illustrating how similar the prose is at times, and apparently Mr Lovecraft was a fan of Ms Moore’s according to a brief biography at Red Jacket Press. 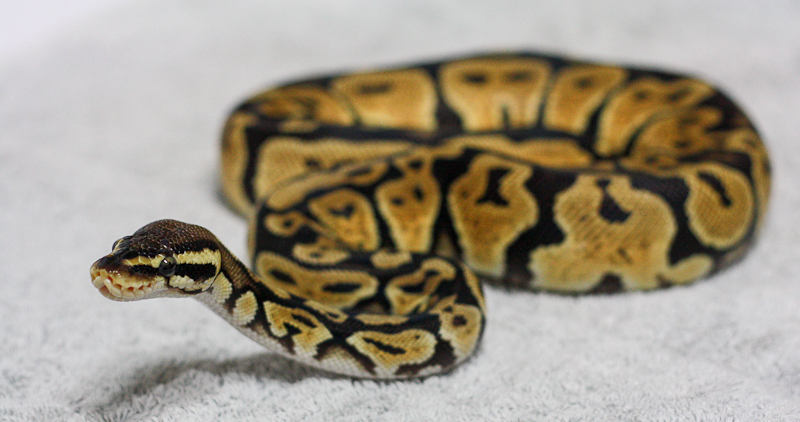 I think I would place her in a stylistic space somewhere between Lovecraft for the darkness and depth, Clark Ashton Smith for slightly less archaic expression of the same and Mervyn Peake for her descriptive use and control of color. Color features very heavily in every tale; she uses it very well to help us enter and visualize her stories. Well, enough observation on the style front, what about the stories themselves?? Smith is hanging out somewhere on some unnamed errand/mission. Some unexpected person appears or random event happens. Smith gets sidetracked into some sort of alternate dimension. After a cool little adventure, Smith saves the day or otherwise escapes. Smith’s nefarious life gets back on track. You could more or less throw the same blanket over the Jirel tales as well. This gave all the stories a kind of sameness that bugged me a little. But, Ms Moore’s aforementioned wonderful style overrode this structural similarity and allowed me to just enjoy each. On the positive side, I keep mentioning the style as a big plus, but also we get to know these characters very well. They are very similar in many ways despite being of opposite genders. Hard, uncompromising, strong, practical, and at the end of each tale it isn’t Jirel’s prowess with the sword, or Smith’s speed and skill with his blaster that come through as the determining factors, it’s their mental strength that enable them to overcome the sticky situations they find themselves in. Indeed, there is very little physical action at all throughout this collection. This is part of the reason why for me these individuals are elevated beyond the archetypal hero of typical pulp fare, and into the realms of true literary characters. They have so much, well… character. Thank you C.L. Moore, you have introduced me to two people that will stay with me forever: Jirel of Joiry and Northwest Smith. 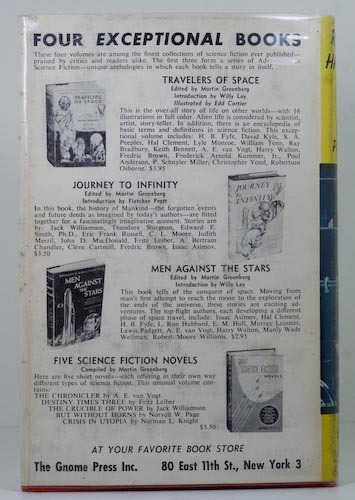 Now I can’t wait to read the GP collection ‘Northwest of Earth’ for more dark adventures with these true heroes from the golden age of science fiction. I have never read anything like this in scifi before. But before I talk about the book, a little background on the author. 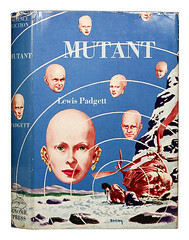 Lewis Padgett was a pseudonym for the husband and wife collaboration of Henry Kuttner and Catherine Lucille (C.L.) Moore, taken from their mothers’ maiden names according to Wikipedia. 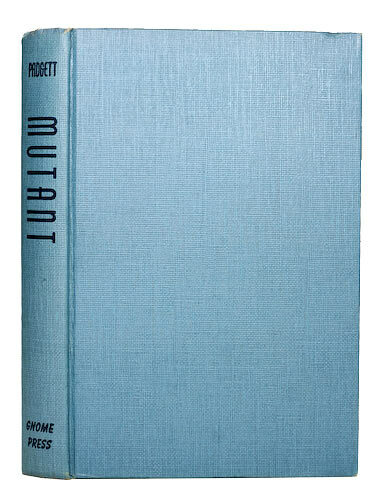 As a team they wrote three books for GP (I have two of them so far – this and Mutant), and C.L. Moore wrote an additional three. ‘Wrote for Gnome Press’ is really the wrong turn of phrase, GP collected the stories from the earlier pulps (as they did for so many of their books) and published them as collections or, as in this case, a coherent set. These stories, there are five in this book, were all penned in the 1940s. All stories revolve around one character – Galloway Gallegher. This man is an inventor. A very good inventor. A genius, in fact. Well… his subconcious is. But only when Gallegher is drunk. Very drunk. So drunk in fact, that Gallegher can never remember exactly what his subconcious (Gallegher Plus) invented, or why. This device is the lynchpin around which all these stories are constructed. However, though all five stories employ this situation, it doesn’t get tired. As you have probably guessed by now, this is comedy. A risky combination that – science fiction and comedy. It works here though. You could almost call it a sci fi sitcom. In fact I would. This is a science fiction sitcom series. Gallegher recovers from being drunk and discovers a robot with narcissistic tendencies in his lounge that Gallegher Plus has invented – he must find out why. 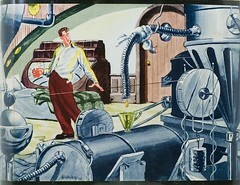 Gallegher recovers from being drunk and finds an earth eating, monofilament manufacturing contraption that Gallegher Plus has invented – he must find out who for and why. Other elements in these stories are the characters that are either a) wanting an invention that they paid an advance on that Gallegher can’t remember, b) trying to do away with or otherwise interfere with Gallegher but he has no idea why or c) his equally lush, crotchety Grandfather. The stories are well paced and the puzzles are well constructed, and genuinely funny. 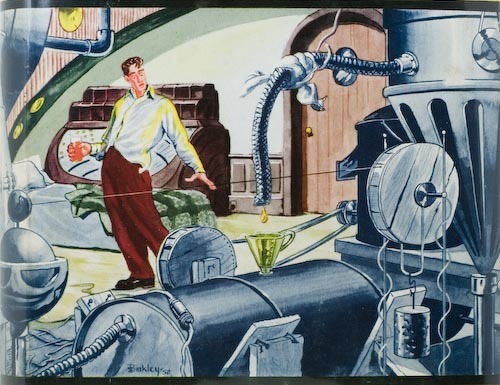 Gallegher’s inventions are hard to fathom, they seem to be a mixture of Heath Robinson, Rube Goldberg, scientific genius and pure fantasy. In fact, if I was to level a criticism at the book, it would be on these grounds. The contraptions defy logic. I know this is a little unfair – it is science fiction after all – but one doesn’t really expect to encounter extreme incredulity. For example, after bombarding a locker with gamma rays it turns into a device within which the universe has stopped expanding, and leading to time travel. Well, it was either the gamma rays or the paint, Gallegher explains. But however, on the other side of the coin, this is part of the comedic charm of a book that doesn’t at any stage take itself seriously. And it never stood in the way of my enjoyment. As an aside, the 1973 Lancer edition is credited to Kuttner only. Ms Moore writes the introduction in which she states ‘…not a word of any of them is mine’. I ask all the people whom I purchase books off to try and give me a bit of provenance on the book – anecdotes, history… that kind of thing. I’m very interested in where these books have been. I’ve had some interesting stories and been able to glean one or two surprising snippets on some of these books myself. Faye, the very nice lady whom I got this book from sent me this interesting tale. This book came from the collection of an elderly neighbor on Pleasant Valley Rd in Woodstock, Illinois. He was a single gentleman who had lived in the family house all his life. He had all sorts of collections in there, and after his death his sister sold his things. Towards the end of the sale she got tired I guess, and when Lyle showed up a couple of times she offered to sell him whatever books were left. She also persuaded him to take the fellow’s pet squirrel, which he had raised after it was blown out of a tree during a storm when it was a baby. 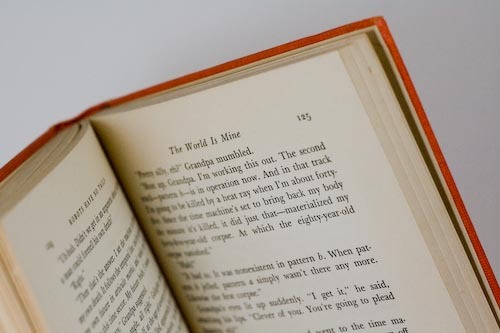 He must have been an interesting man because he had a quite a variety of books – astronomy, geography, various branches of science and science fiction, and other fiction and we were sorry we had not gotten to know him. Great stuff… I love stories like this. As I have mentioned elsewhere on this site, they make these books come alive. Thank you very much Faye. In my previous post I gave Dave from Lipson Robotics a plug. He asked me a question about this book over on The Great Gnome Press Sci Fi Odyssey Flickr site, and I then discovered his fine examples of robot manufacture. The point I’m trying to make is that Daves ‘bots are a perfect match for this book. Lets begin by having a look at the cover. What a superb cover it is. Inked by the incomparable Ric Binkley, it’s deserving of a closer look so we can fully appreciate this fine example of ’50s Sci Fi art. Absolutely stunning. Now, you go and check out what Lipson Robotics are turning out and come back here and tell me that any one of their creations wouldn’t be perfectly at home on this cover. Didn’t think so. Congrats Dave, you’ve nailed that retro look you are after. 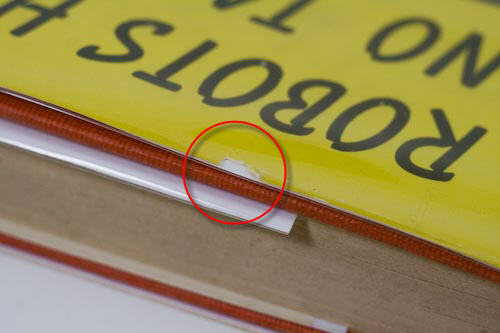 So, while the dust jacket looks great at first glance, if we check it out a bit closer we can see some wear and a sizeable chunk out of the top front edge. Right in the center of the jacket too. Damn. Looking at the ends we notice that it sits nice and square. Beautiful. You know, it’s so refreshing to read nice white pages, as opposed to the nasty yellow and sick looking fare that we now get in GP ‘s later books as a result of the cheap acidic paper they used. A close up of the extremities reveals a couple more little issues, chiefly the erosion of the boards, though the jacket isn’t too bad at these points. The top of the spine also has a bruise. 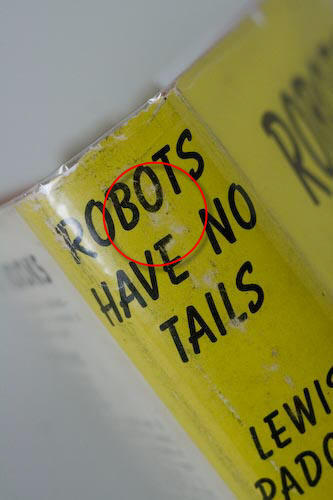 I’ve highlighted the erosion there. The boards are quite clean, although you can see a little staining in the odd place. The pic below also better illustrated that bruise to the top of the spine. Actually, the staining looks a lot worse here due to the light. In real life it isn’t as prominent. Indeed, you probably wouldn’t notice them unless I pointed them out. The top rear corner also has a bit of a ding. Well, to wrap it up lets check out the back. 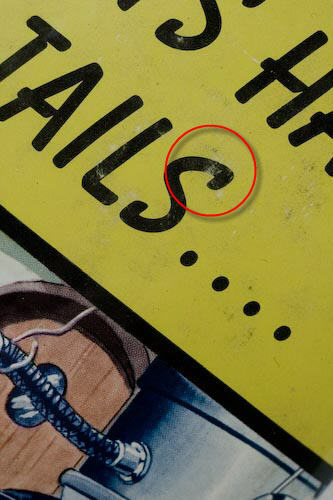 You can see the general scuffing is quite evident here, especially on the creases. There are also a couple of closed tears that you can’t see in these locations also. 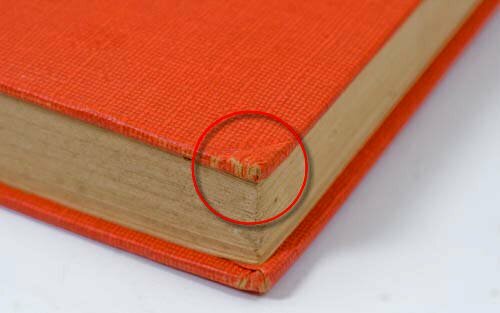 Binding: Orange boards with black lettering on spine. 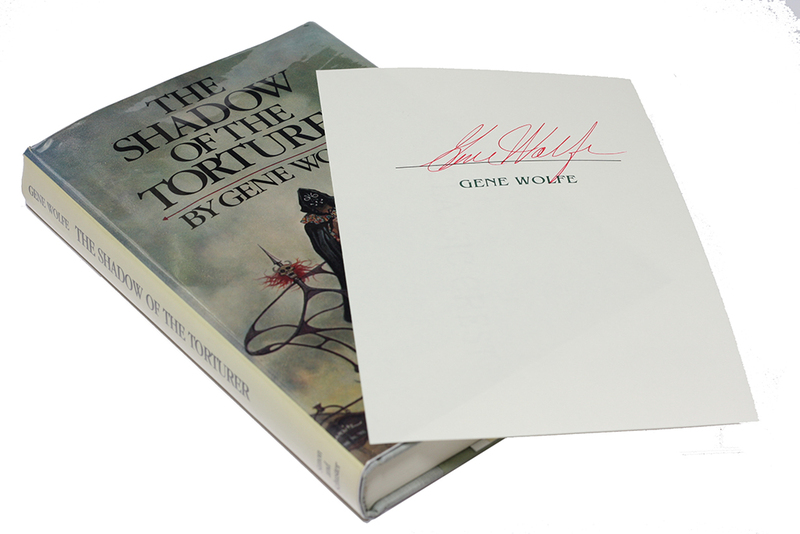 GP Edition Notes: 1st edition stated on copyright page. Comments: This is a very sought-after title and I’m very happy to have it, especially at that price. I just love the cover. The flaws I’ve highlighted here don’t seem as bad in real life. A fantastic addition to my library. What do you think?? Good ones, I hope. 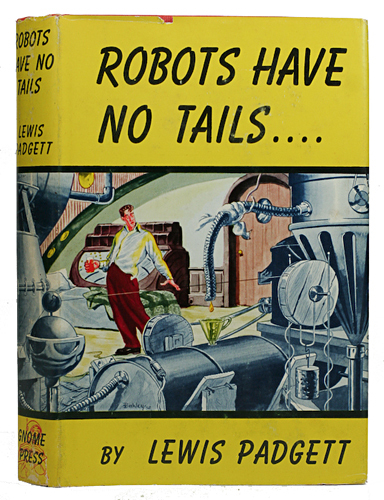 I received Lewis Padgett‘s Robots Have No Tails today. 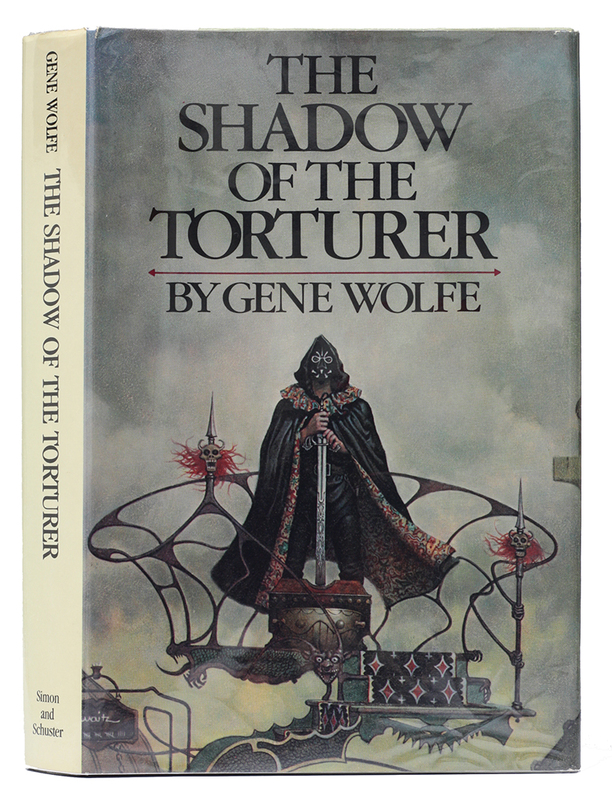 As I mentioned previously, the dust jacket is a bit on the worn side, but the great cover art by Binkley is bright. I got exactly what I expected, so I am quite happy. Many thanks Faye for an excellent book. 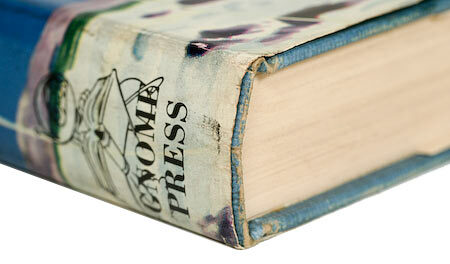 No dust jacket protector though, it’s a good thing I have plenty at home.